Artist’s work in progress. 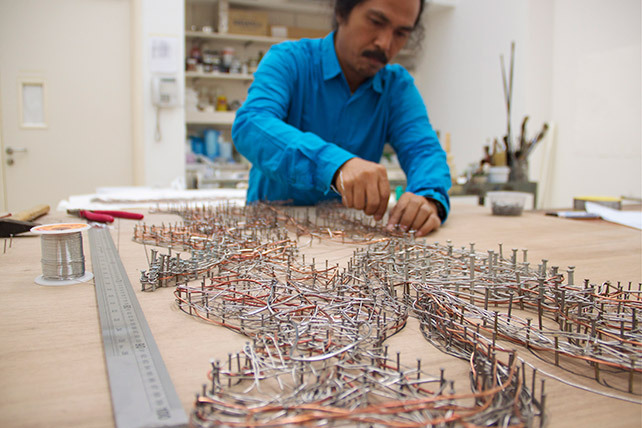 Entang in the STPI artist studio during his first residency in April. A firm believer of borderless art, Entang Wiharso creates provocative works that speak volumes about universal issues of power, dreams, loss and love. Instantly recognisable, his visual vocabulary of distorted human figures is interconnected with concepts of social and personal reflections. At STPI, the artist also embarked on a different trajectory, producing large-scale artworks that explore strong socio-political concerns and the idea of borders, division and differences, but this time using acrylic and paper pulp — both forms never seen before in the artist’s oeuvre.